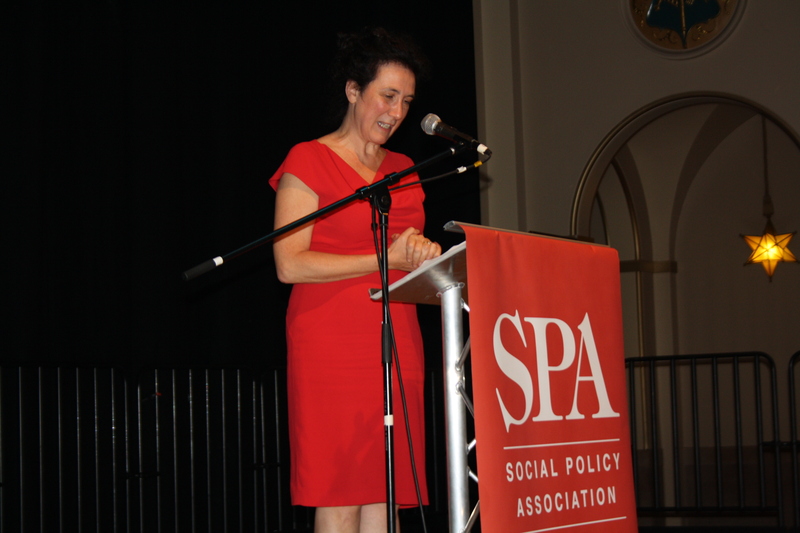 The 2014 UK Social Policy Association Awards were presented following this year’s annual conference dinner on 14 July at Sheffield City Hall, hosted by the University of Sheffield. 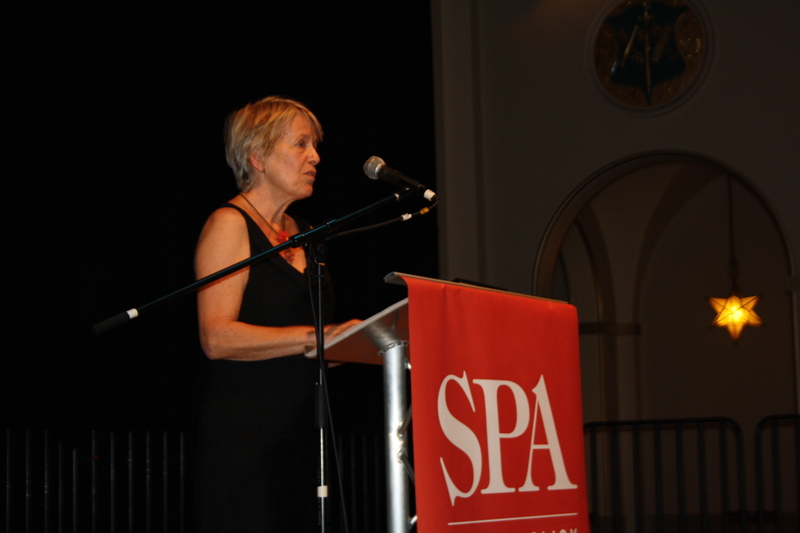 The awards were presented by acting SPA President, Prof. Adrian Sinfield. There were six winners across three categories. 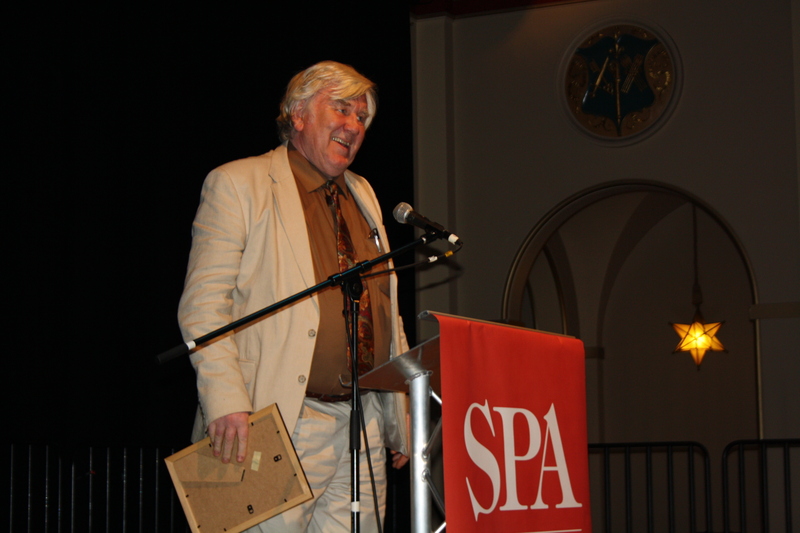 Winners of the 2014 SPA Special Recognition Award were Professor Gary Craig, Professor of Community Development and Social Justice, Durham University; Professor Caroline Glendinning, Emeritus Professor of Social Policy, University of York; and Professor John Veit-Wilson, Emeritus Professor of Social Policy, Northumbria University and Visiting Professor in Sociology, Newcastle University. The two winners of the Best Non-Academic Award were Anna Coote (Head of Social Policy, New Economics Foundation) and Carey Oppenheim (Chief Executive, Early Intervention Foundation). 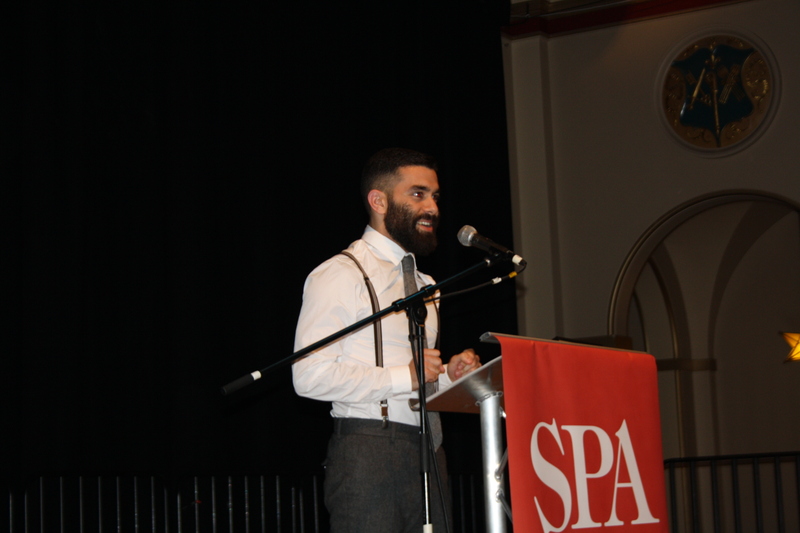 And the winner of the Best Postgraduate Paper award, presented at the 2013 SPA Conference, was Faraz Vahid Shahidi, Doctoral Researcher at the University of Toronto, Canada. Congratulations to all our winners and many thanks to all those who nominated. 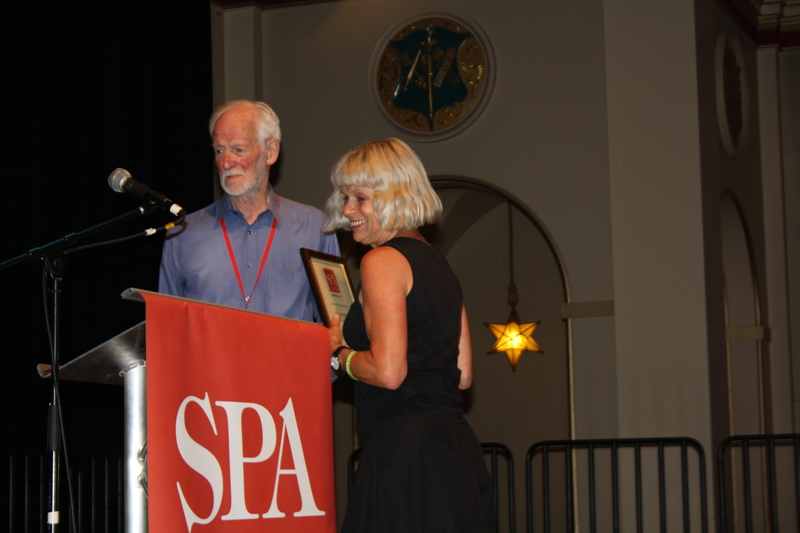 The Special Recognition Award is made to SPA members who have retired, are due to retire, or hold an Emeritus position and marks contributions in the field to research, teaching and learning; impact on political process and discourse; and recognises the esteem in which the recipient is held. The three winners of the Special Recognition Award this year were Professor Gary Craig, Professor Caroline Glendinning, and Professor John Veit-Wilson. Professor Gary Craig, Professor of Community Development and Social Justice, Durham University. Presenting the award, Adrian Sinfield stated: “Gary’s easy-going bonhomie is deceptive, not for any illusion as to the quality, but because it conceals the rigorous industry behind the great contribution he has made. He is now Professor of Community Development and Social Justice at the University of Durham after chairs at Hull and Lincoln. At Hull he became the world’s first Professor of Social Justice and established WISE, the Wilberforce Institute for the Study of Slavery and Emancipation, the first interdisciplinary slavery research centre. His social policy career started in community development and action research projects. He could be presented as ‘Mr. CD’ – community development – from the CD Project in Benwell in the 1970s. Even then he was publishing and editing, particularly the Community Development Journal, which he has turned into the field’s leading international journal. He has made an enormous contribution inside and outside the UK, recognised for example by a Special Consultative status from the UN. In addition – and closely related of course – is his work for participatory approaches to policy development, and much further research and campaigning on ‘race’ and ethnicity, slavery and poverty – all with very many publications and much TV and print media output. His contribution to the social policy community includes leading a major reorganisation while SPA secretary. His work on and about RAE panels will be well recognised by many of you, and his initiatives supporting new career researchers. Receiving the award, Gary commented that it was a great honour and privilege to receive the SPA award as it was from his peers. Gary bashfully stated he had struggled to understand why he had been nominated for the award but noted that throughout his personal life and political practice he had always tried to stay true to the values of social justice. Gary also noted that he had been concerned about the usefulness of research long before the word impact came into fashion. Following his formal acceptance speech, Gary then sang ‘Hard Times’ by Stephen Foster from the floor, to rapturous applause. Professor Caroline Glendinning, Emeritus Professor of Social Policy, University of York. Presenting the award, Adrian Sinfield said: “Caroline is now Emeritus Professor of Social Policy at the University of York and especially connected with SPRU, its Social Policy Research Unit. She has spent her career between York and Manchester but her work has covered a much wider area – particularly impressive for the fact that she has always had to raise funds to support herself and her research team. In the last decade her average strike has been over half a million pounds a year. The production of over 100 refereed journal articles, some dozen books written or edited, speaks for itself. ‘An exploited contract researcher made really good’ is how someone summed it up. Recently her 7-year leadership on adult social care and individualised budgets has provided great strength to SPRU’s Department of Health-funded research programme, ‘Choice and Independence Across theLife course’. There has also been much earlier scholarship. I will only note her pioneering research into families with disabled children and her editing with Jane Millar of two editions of Women and Poverty in Britain – a classic for teaching and for provoking much further work. In terms of impact Caroline’s work must score very highly. There can be few teaching, researching and practising in the fields she has contributed to who have not drawn on her findings, her insights, her advice and her lobbying. Receiving her award, Caroline extended her thanks and explained how spending one’s career as a ‘jobbing researcher’ on soft money forces you to follow policy and become an expert in a very small area. Caroline acknowledged the benefit she had gained from being part of the SPA Executive and also as a regular attendee of the annual SPA conference in broadening her horizons and enabling her to remain up-to-date and involved with wider academic thinking and research. Professor John Veit-Wilson, Emeritus Professor of Social Policy, Northumbria University, and Visiting Professor in Sociology, Newcastle University. 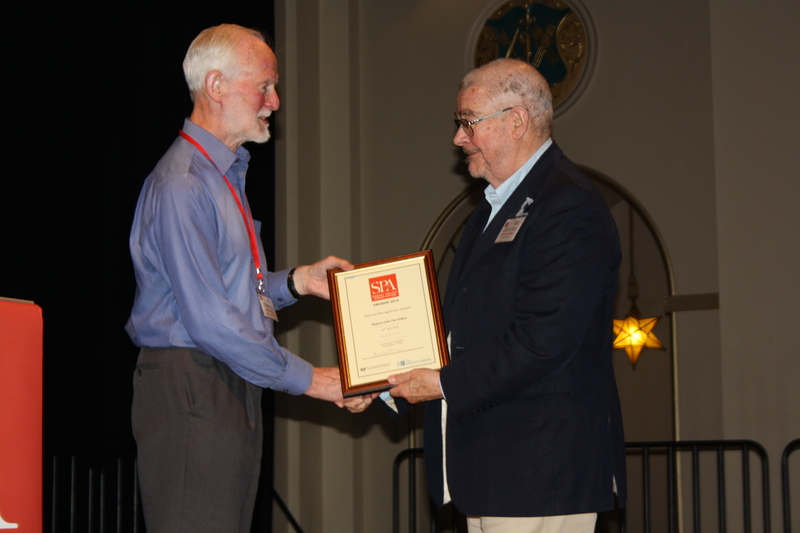 Presenting the award, Adrian Sinfield first acknowledged he had been one of John’s nominators and a long-standing friend, before explaining, “John must be the only person specially recognised by the SPA who has worked for the FBI. But that’s not from a Snowden file inWikiLeaks: the Federation of British Industry was the forerunner of the CBI. A key member of the big poverty study led by Peter Townsend and Brian Abel-Smith in the 1960s, John has long worked for a clearer and broader understanding of the meaning of poverty and the value of a minimum income standards approach. John tends to dismiss detailed rigorous work, arguing with and lobbying parliamentary committees, government consultations, voluntary bodies – indeed, anyone who will listen – as ‘ranting’, but those of us who have worked with him know the value it has had. He is not the Social Policy Ancient Mariner. The range of his work with the Child Poverty Action Group deserves particular comment for its scientific, public and organisational content. A founder-member with his mother, Harriett Wilson, in 1965, then active on its Executive and Board, for over half its existence, and recently its Vice-Chair, John has been fighting, counselling and writing – keeping it going through very difficult periods and getting its message out precisely and forcefully. Active engagement with cross-national and international groups such as the European Anti-Poverty Network has strengthened the campaign for a European Minimum Income Directive with a broader and research-based consideration of adequacy. Receiving the award, John spoke of the ‘voices of the poor’ and stated it was time that people who experience social problems are enabled to speak, not that they can’t speak for themselves but they are not listened to, partly because they can’t articulate their views in a way that is heard by those in power. The award for Best Non-Academic is granted to a non-academic who, in the opinion of the judges, has made a significant and lasting contribution to the field of social policy, either through campaigning, lobbying, service provision, fundraising, journalism, funding of research, dissemination of research (particularly to practitioners and other non-academic audiences) or through other non-academic means. This year, judges made two awards in this category. In introducing the category, Adrian Sinfield acknowledged that both award winners have achieved a very great deal during varied careers in a wide range of settings – pressure group, university, advisory organisation, public policy think-tank, consultancy and other roles on the edge of government. Presenting the award, Adrian Sinfield stated: “Anna has been Head of Social Policy at the New Economics Foundation for the last six years. Her research, analysis and lobbying there and earlier at, for example, the UK Sustainable Development Commission, the King’s Fund, IPPR (the Institute for Public Policy Research), and the New Statesman, have focused on some of the most important and pressing issues concerning social welfare, from health, to gender equality, working time and the environment. To the list of roles I have already given should be added television producer and editor, journalist – editing, reporting and freelance. It just goes to show what you can do with distinctions in Modern History and Politics from Edinburgh University. Presenting the award, Adrian Sinfield stated: “Last month Carey becameChief Executive of the Early Intervention Foundation, a What Works Centre and charity which champions and supports the implementation of evidence-based practice that gets to the root of social problems enabling babies, children and families to flourish. Carey’s great contribution to social policy has included three years co-directing IPPR; two years chairing the London Child Poverty Commission; five years from 2000 as Senior Advisor to the Prime Minister. This included developing policies for the Child Trust Fund, work-life balance, Sure Start and child care. She could tell us much about trying to build links with business and the voluntary sector and the struggles over setting up Pathways to Work. Long before that many of us will recall her valuable time at CPAG, as researcher and acting deputy director, and the impressive range of publications that started then, some with Ruth Lister. It would be fascinating to trace the careers of others whose educational career began at the Anna Freud Nursery run by ‘Miss Freud’ herself. Maybe it is Carey’s skill as an enthusiastic swimmer that has enabled her to keep her head above water in all the political currents of her career. In response, Carey noted that she was both surprised and honoured to be nominated. She explained how her work has tried to change policy and improve social conditions for families, and spoke briefly about a range of policy developments, including policies and schemes that have been abolished. Carey explained how the EIF works in a preventative way with children and families, focusing on early action and intervention. She concluded by saying that she hopes to do justice to the award during the next stage of her career. This award is for the best paper presented by a Postgraduate student at the previous year’s conference. Presenting the award, Adrian Sinfield acknowledged that Faraz had been awarded a total combined score of 55 by the judges out of a possible maximum of 60, for his paper presented at the 2013 SPA Conference in Sheffield, entitled ‘Varieties of Welfare Capitalism in Crisis: A Qualitative Comparative Analysis of Labour Market Reforms in 18 Advanced Welfare States’. Judges had described the paper as ‘A thorough discussion of the literature and a well-argued challenge on drivers’; ‘an imaginative and rigorous piece of international comparative research’; ‘using the findings very effectively, his innovative approach enables him to draw new insights, providing something articulated and original which reverses the established literature’; ‘a complex paper – I think I read it about 3 times’; ‘a formidable quantitative comparative study making an important contribution to contemporary arguments about welfare state retrenchment.’ Sinfield concluded, “we hope to see it in print very shortly”. In accepting his award, Faraz expressed his thanks, and spoke of his academic inspiration and hopes for the future. In a break from SPA tradition, Sinfield also made special mention of Ruth Patrick, doctoral researcher at the University of Leeds, for her paper, ‘Working on welfare: early findings on the lived experiences of welfarereform’. The judges sought special mention of Ruth as runner-up in this category for her longitudinal qualitative work with out-of-work benefit claimants. Photographs courtesy of the Sociological Studies Department at the University of Sheffield.